It's rainy season once again, and a big problem for car owners during this time is finding a place to safely store their car during a flood. The right answer to that problem will vary depending on where you live, but here are a few tips that you should always keep in mind. Stay dry! This is a pretty obvious tip, but a crucial one to remember during a flood. If you live in a flood-prone area, try to find a place with higher elevation to park your car. Multi-storey mall parking lots are a pretty safe bet, and many establishments actually waive their parking fees in anticipation of a storm. If you think there's any chance that water will rise up into your car's engine bay, do yourself and your car a favor by disconnecting the battery. Even when the engine is turned off, the battery is still powering some of the car's electricals. When you add water to the mix, your car's internal systems could have all sorts of trouble. 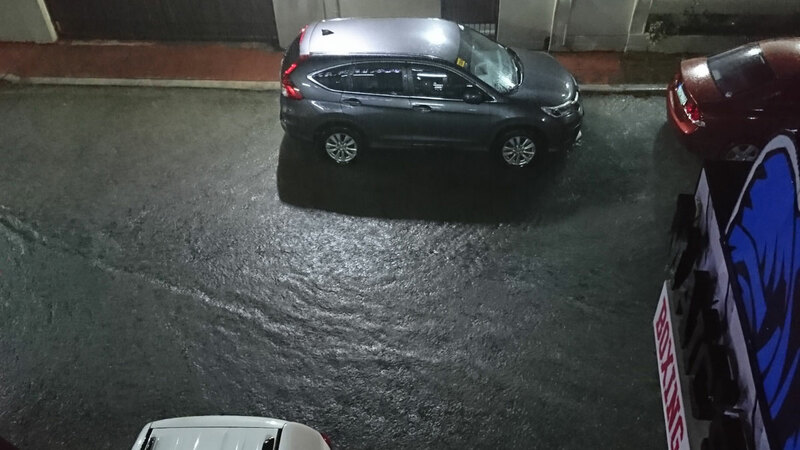 I personally witnessed a car parked outside my house during Ondoy with the battery still connected. As the water rose, the car's windows rolled up and down while the alarms and lights went haywire. I'm sure the car's owner regretted not knowing this tip. 3) Park away from any potential hazards. Things float (and fly, too) during a storm, so take a look around your car for anything that might damage it. That includes trees, posts, trash cans, and anything else that could potentially smash into your car's panels and windows. 4) Your own safety is more important than your car. As car owners, we do our best to keep our cars safe. But always remember that your personal safety is way more important. So by all means, do what you need to do to shield your car from a flood. Just don't risk your own life in the process.